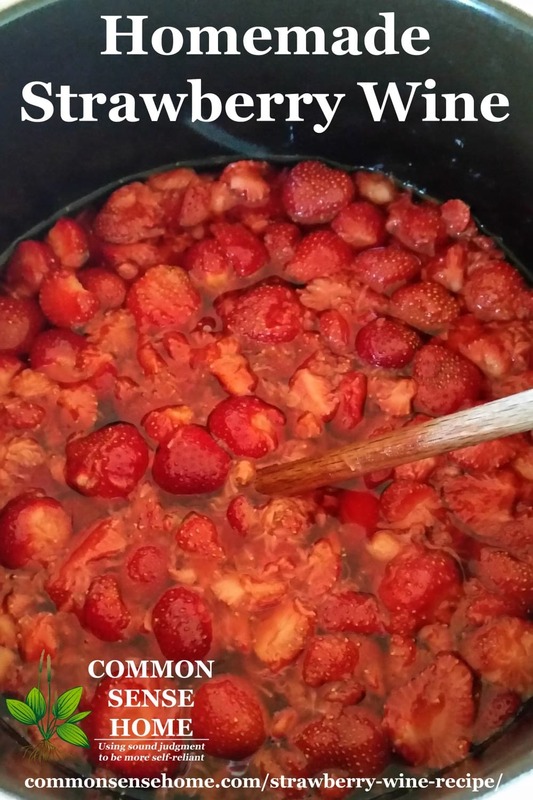 Stir wine must with wooden spoon to dissolve sugar and simultaneously mash the strawberries. When cooled to 85°F (29°C), add yeast and yeast nutrient. Cover and stir daily for seven days. Store out of direct sunlight for 30 days. Rack into a clean fermentation vessel. Store for 30 days more, rack again. Allow to settle 3-5 days and bottle when clear. Age for at least 6 months. Flavor improves up to a year. From Jack's description, this looks like a wine that will not improve with much longer storage, so it's okay to enjoy it young. We made a double batch, so I plan on tasting it at intervals to see how the flavor profile changes. The 2016 strawberry season was a bountiful one at our favorite local u-pick farm, Red Grouse Farm. Becky and her family spend long hours out in the berry patch, tending everything by hand so I don't have to. 😉 They don't use any herbicides or pesticides, and use holistic farming practices that build the soil instead of mining it like conventional farming. 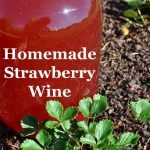 Becky (the owner) and I had a great conversation about some of our favorite soil and permaculture gurus as she helped us fill our strawberry baskets for this wine. I've had a number of readers ask why we don't grow our own strawberries. We have land, but strawberries are labor intensive, and since I have a source I trust close by, I support their efforts. Meanwhile, we're focusing on crops I can't find elsewhere, and/or those that are more expensive, like blueberries, raspberries, gooseberries, aronia berries, bush cherries, seaberries, hardy kiwis and others. If at all possible, get your berries from someone you trust, and ask them what, if anything, they spray. Conventional strawberries are on the Dirty Dozen list. The Environmental Working Group found 17 different pesticides on a single strawberry sample. There's no way I want to turn that into wine. Organic strawberries may not be much better. Recently, a neighbor of mine shared her own concerns about organic strawberries. She used to buy a large carton of organic strawberries for her family at a local bulk foods club. One of the kids would clean and slice them when they were brought home, and they'd get eaten in a day or two. This batch was different. No one in the family liked the taste, and eventually they were tossed to the chickens. The chickens refused to eat the organic strawberries. It's no lab test, but it did me wonder what the heck was on those berries. My youngest is a huge strawberry fan, so while they're in season we keep a big bowl in the fridge for fresh eating. 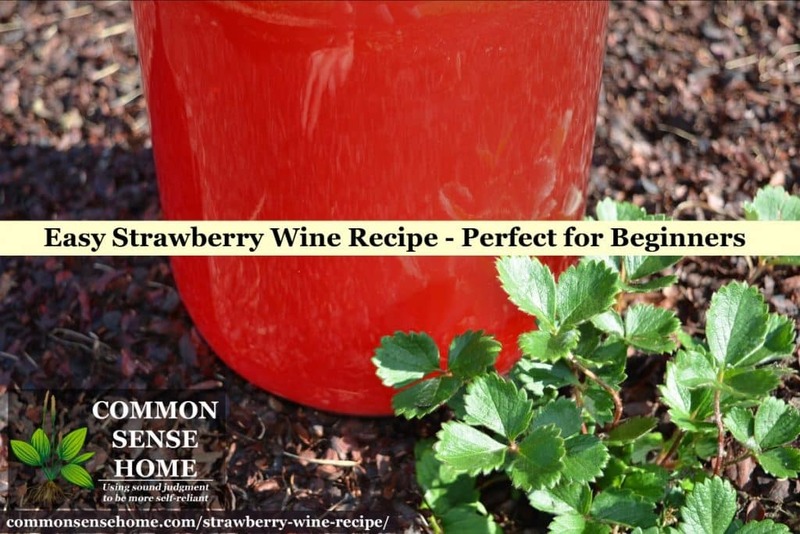 To enjoy them year round, I use the recipe in the post 12 Ways to Preserve Strawberries – Plus Tips to Keep Berries Fresh Longer. What's your favorite way to enjoy strawberries? Leave me a comment and let me know! One the 7th day, strain through cheesecloth or a flour sack towel. Transfer to secondary fermentation vessel with airlock. Age for at least 6 months. Flavor improves up to a year. The yeast you can order online through the links provided, and sugar you should be able to find locally. The website Farm Fresh North Carolina has a post titled Where to find organic U-pick strawberries that may be of help. What do you mean by “rack into a clean fermentation vessel”? “Racking” means to transfer, typically via siphon hose. So you transfer from one gallon jug to another, leaving the sediment behind in the first jug. 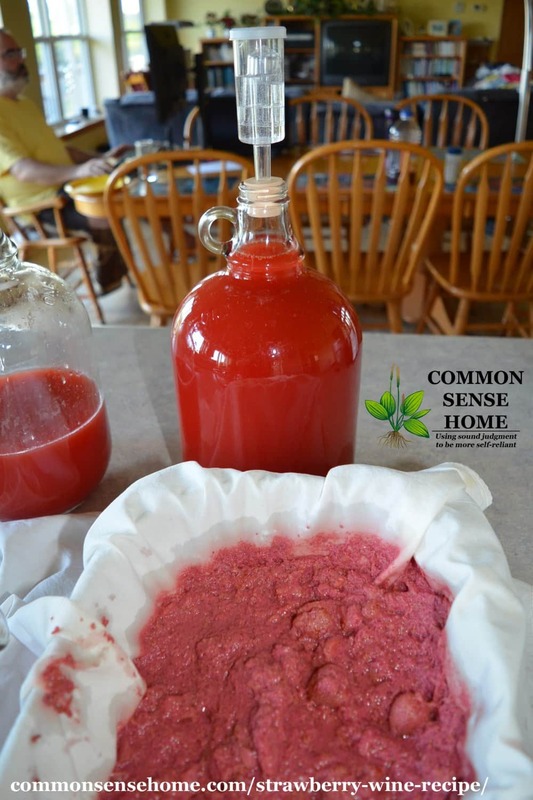 If you don’t have a second carboy/gallon jug, you can siphon into a different container, such as a large stockpot, wash your original jug, and then transfer the wine back to the jug. The purpose of racking is to produce a clearer wine with a cleaner flavor profile. The yeast dregs (sediment at the bottom of the jug) will make the wine somewhat cloudy, and over time will influence the flavor. The dregs are edible, they just have a strong yeast flavor. When you say age for 6 months, is that from when I bottle or from after I strain and place into demijohn. Hi thanks for that. Currently on day two in the bucket after stirring i get bubbles :). I have placed the lid on top but not sealed down. Would this be ok. Sorry to be a pain and thanks for the speedy reply. It would probably be best to have a three gallon crock if you double the recipe. During fermentation, there is foaming and the berries rise up. A batch will fill 4-5 wine bottles. Blueberries are so expensive here that I haven’t given it a try yet, but there is a simple recipe in How to Make Wine in Your Own Kitchen. Note: She uses wet bread yeast in many of her recipes, because it was more available back in the day. You could substitute a good wine yeast and skip the bread. Directions: Rinse berries quickly under cold water only if gritty and dusty. If they are clean, the natural bloom contains helpful wild yeasts. Place berries into large stockpot and mash with a potato masher. Bring 2 quarts of water plus the sugar to a boil. Boil for five minutes, pour over berries. This sets the color. Add the other two quarts of water and stir well. Moisten yeast with a few drops of water and spread on the toast. float the toast, yeast side down, on the surface of the liquid. Put in a warm place to ferment for two weeks. Stir gently from the bottom every day during this period. Strain the wine through a jelly bag or flour sack towel, squeezing pulp very dry to extract maximum color and flavor. Return to canner kettle to settle for two days. Siphon into clean sterilized bottles and cork lightly. This wine takes about three weeks to finish fermenting in the bottle, so don’t be too eager to fasten the corks tightly. When fermentation has ceased, cork tightly. Keep for at least six months, but if you wait a year the body and color of the wine will greatly improve. The author uses a canner kettle for her home brewing. I’d likely move things to a crock covered with a flour sack towel to keep bugs and dust out. After straining, I’d transfer the brew to a gallon jar, and then bottle after the second ferment. I would like to know if you double the recipe Do you need a crock larger than 2 gallons. also how many bottle does a batch make. Thank you. About 1/2 tsp of pectic enzyme per gallon helps alot in clearing it up before bottling. When you say ” Cover and stir daily for seven days. ” do you mean with a lid that’s not air tight, no airlock? You could use an airlock if you have one of the wide mouth ones that allows you to stir the ferment, but it’s not required. Here’s a little trick learned form many fresh fruit batches. You can purchase a nylon mesh bag at your local beer/wine making shop or online. Just place it into your primary fermenter or crock, and then add all the ingredients per your recipe. When performing your first racking, just lift the bag out carefully and squeeze the juice out. Makes clean up and first transfer much easier. Launder it and your ready for the next go round. Awesome recipe, Laurie! I’ve been looking to make something special for my girlfriend for a while now. 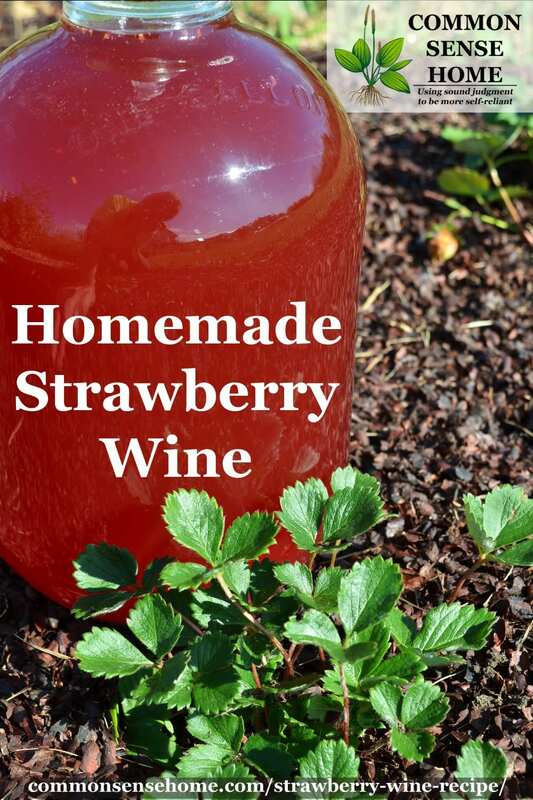 She loves strawberry wine – so this is it! I started yesterday, it smelled so sweet and had such a pretty color, but now day 1, it’s not the pretty red color, looks like it’s turning brown. Is that normal? It will get darker, but mine doesn’t turn full out brown. How does it smell? If the smell and flavor are okay (fermenting, not rotting), you’re probably fine. Hi trying your recipe for the first time. I followed it times 3. My wine yeast is Lalvin EC-118 a packet is 5 g. Should I add 3 times the yeast to my must? Or will 1 packet be enough? Typically one packet of commercial yeast is enough for up to five gallons of wine. Odds are it will say on the front of the package. Hi I am coming back to wine making after 30 year lay off watching my dad brew.. sadly he is no longer with me so i cant pick his brain.. I never saw him stirring wines… it seems to me like this is a time you could potentially add airborne and unwanted bacteria to your wine.. I am sure he just used to seal it up and leave it to ferment.. I am making a coffee wine not strawberry but the principles are surely the same?.. Am i risky my wine by stirring it?? why do you do it? I stir during the initial ferment simply to make sure the fruit is breaking down evenly and flavors are well mixed. It also makes sure that since I use an open crock during the initial ferment, that the same fruit doesn’t stay on the surface and potentially spoil. The commercial yeast is very vigorous, and will normally outcompete wild yeasts and other microbes. Once the fruit is out, I place the brew in an airlocked container and don’t stir anymore. If you go to an airlocked container right away, then you don’t need to stir, but I don’t like cleaning fruit residue out of my gallon jugs so this is easier for me. Who said anything about methyl bromide? I had an older link in the post that went to a discussion of methyl bromide being used on berries which I updated when the post was last updated. My yeast says up to 5 gallons. So could I do x5 on all ingredients besides the yeast? Ive seen campden tabs and pectic enzymes used on other recipes. You dont use those? Yes, the yeast can ferment up to five gallons. Campden tabs are made with sulfites (typically sodium metabisulfite) and are used to sterilize the wine. Sometimes they’re used at the beginning of brewing to kill off wild yeasts and molds, sometimes they are also used just before bottling to kill off the commercial yeast, too. I’m sensitive to sulfites, and the modern strains of wine yeast are pretty aggressive, so they normally outcompete problem microbes as long as you follow basic sanitation rules. I’ve never had a problem with spoiled wine using commercial yeast. Pectic enzymes help clear the “pectin haze” in the wine by some fruits. This is largely a cosmetic issue, and I don’t much care what my wines look like, so it’s not critical for me. After racking the wine from the carboy to the bottles and leaving behind the lees, the wine is usually clear enough for our tastes. If you want to use additives, you certainly can. I’m just a basic country wine sort of gal. Simple is good. my first batch of wine ever, i am a true newbie! my question is; now that i have racked the wine into the secondary fermentation vessel, in my case a 3 gallon carboy, my wine is not foaming or bubbling any longer. is that normal for this recipe or did i kill my yeast? it was bubbling and foaming on the first 7 day stretch. It’s normal for it to calm down after the first more aggressive ferment. Initially, the yeasts are gobbling up the more abundant sugars, so they burp more. Fermentation slows down after this period, but doesn’t stop completely – this time in the carboy as insurance against exploding bottles. As long as you didn’t boil it in between, your yeasts should be fine. Think I could use half strawberries and half raspberries for this recipe? By crock do you mean ceramic or could you use a stainless steel stack pot? I use ceramic crocks, but you can use that, stainless steel or food grade plastic.